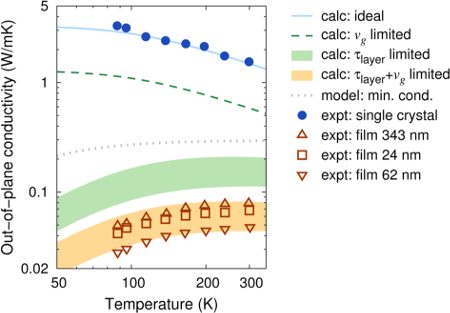 Films of layered substances such as WSe2 and other transition metal dichalcogenides can exhibit a reduction in the out-of-plane thermal conductivity of more than one order of magnitude compared to that of the bulk, effectively beating the glass limit Science 315, 351 (2007). We can now provide a sound rationale for this behavior that is based on first-principles calculations, which has been recently published in Chemistry of Materials. It turns out that one must account for both phonon confinement effects (softening and localization) and interlayer scattering that result from the variations in layer spacing and stacking disorder. The analysis demonstrates that these effects are not specific for WSe2 but should be equally observable and exploitable in other layered systems.